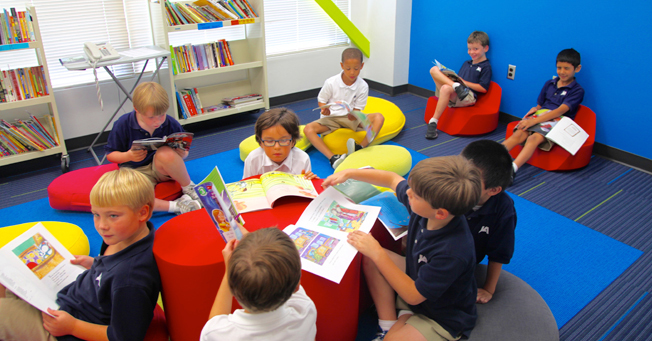 The Jackson Academy Lower School Library has a collection of 12,502 books. The library is open from 7:30 a.m. until 3:00 p.m. each day. All students in grades first through fourth have a scheduled library period for forty minutes each week. During the scheduled library periods, students are provided library instruction to assist them in locating resources to benefit the curriculum. Games utilizing various library skills are enjoyed by students. Students also have the opportunity to read their books, read magazines, and read e-books from newly acquired educational websites. Throughout the year, information is presented to students about many authors and illustrators. Another opportunity which enhances an appreciation of literature for the students is dramatization using short skits about books. Some of the special events held in the library each year are Scholastic Book Fair, scavenger hunts, visits by book authors, Library Wall of Fame, and other exciting library adventures. Did you know you can join the JA Birthday Club? Donate a hard back book in honor of your child. Call the librarian at 601.364.5728 for more information.